Victoria, BC is a lovely little island of Canada that is picturesque and well known for Butchart Gardens. But if you don’t know, it’s also a delightful place to pass the time away with fun little bookstores, tea shops and walks along the harbor. It’s also the location of a tea festival every year, and so every year a friend and I drive up there to enjoy a weekend of bliss. 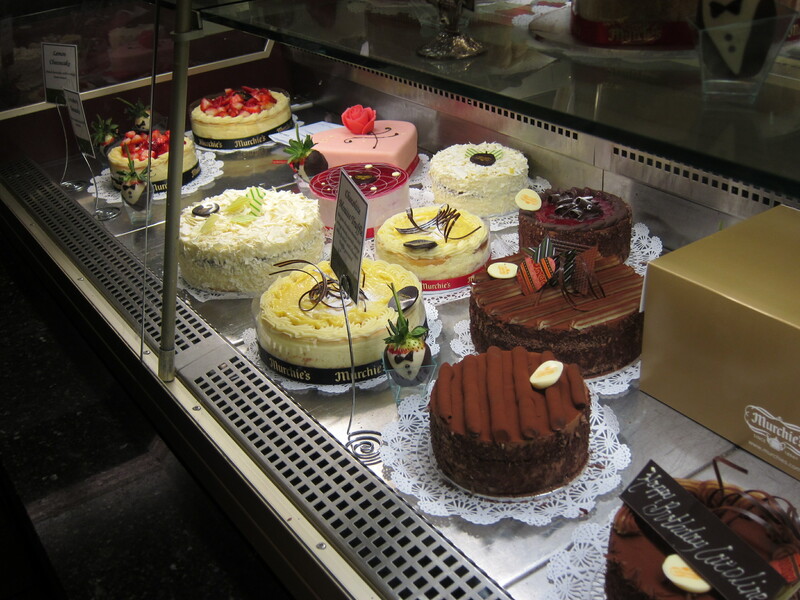 Gorging ourselves at Murchie’s – though the lines are some times long, many of the cakes are worth the wait. I am sorry to admit that instead of a healthy lunch, I opted for a sandwich and two entire desserts just for me. 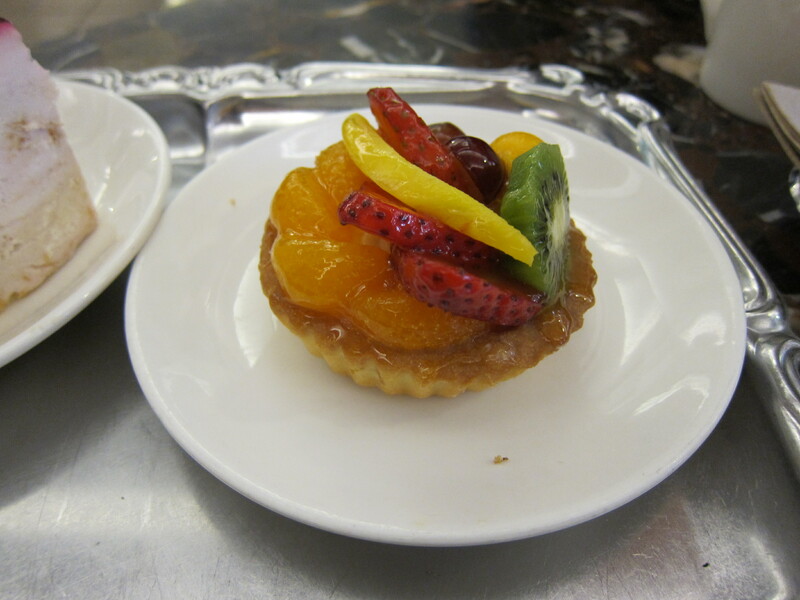 The cheesecake was tasty and the fruit tart delicious. I do not regret this decision. 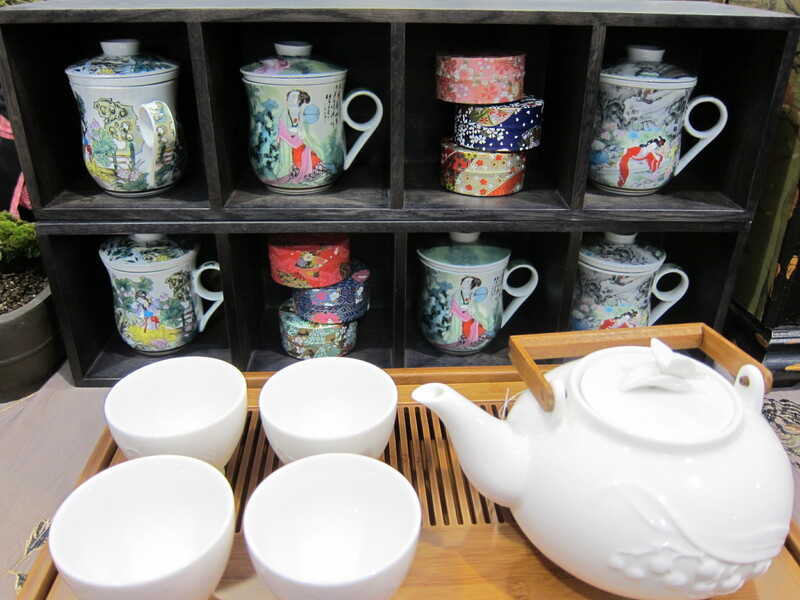 Tea display at the Victoria Tea Festival – usually full of vendors and providing an enjoyable afternoon with displays, samples, souvenirs, talks and classes. If you like tea I definitely recommend it. 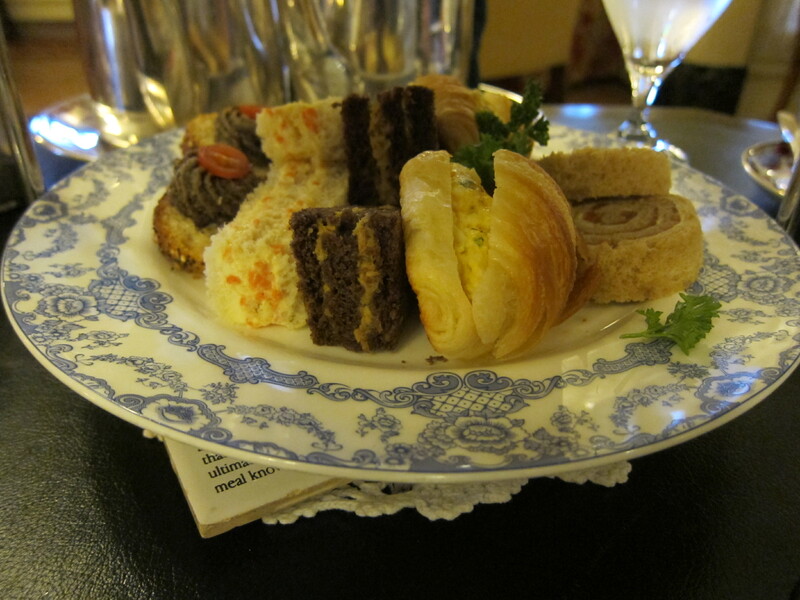 High tea at the Fairmont Empress – a very posh affair with a fresh fruit cup, sweet treats like chessboard cake, Key Lime chocolate cake and nut shortbread, delightful little sandwiches with traditional egg salad or fancy crab, and a scone with tiny jam jars and fresh cream. You have to dress up a little and it is a fun time. 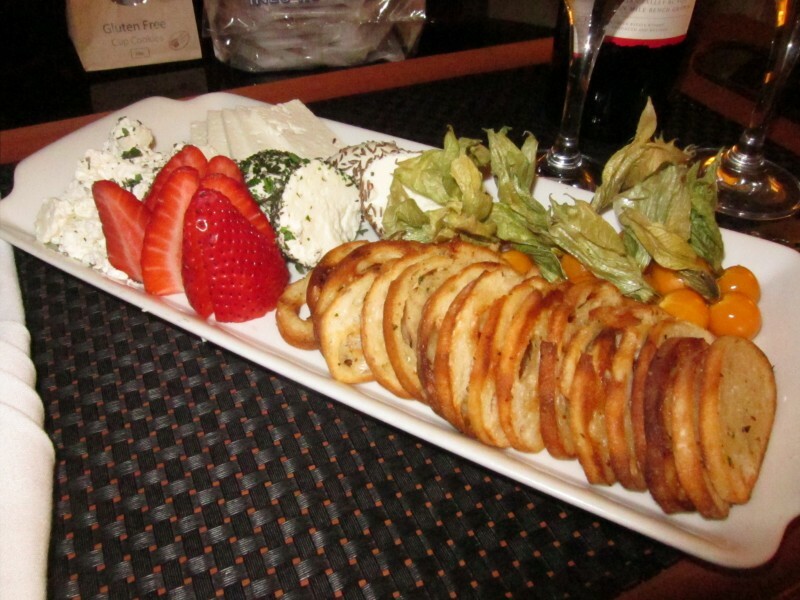 Wine and cheese plate at the Magnolia Hotel – a nice hotel that is central, with excellent service (better than the Fairmont Empress in my opinion). Everyone was extremely friendly and their Girls Getaway package features money to spend at their spa or restaurant, and a cheese and wine plate. They were so nice about providing goat and sheep’s milk cheeses only, all fantastic (I regret not asking for the names) and a bottle of very good red wine. The spa was a relaxing way to start our morning, I highly recommend it. 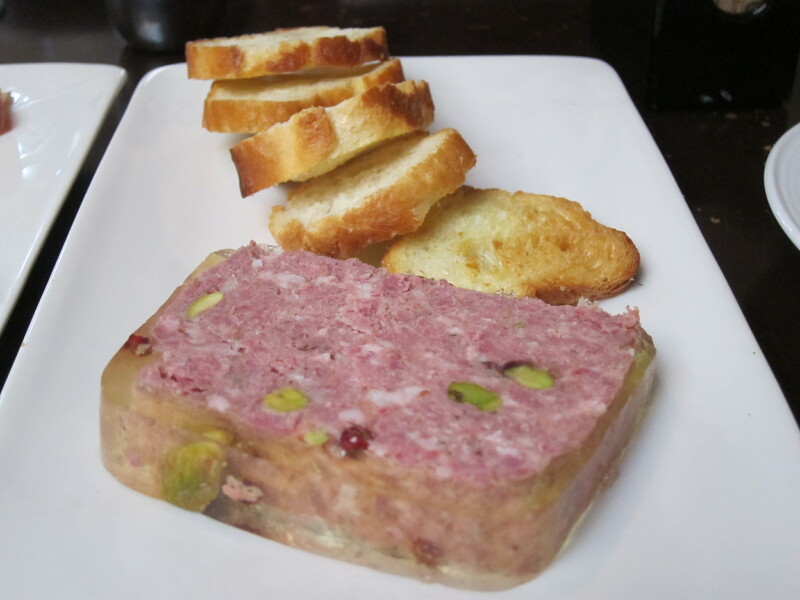 A French inspired lunch at Bon Rouge – right next door to the hotel is a French bistro that is packed at night and reasonably quiet on Sunday afternoons. 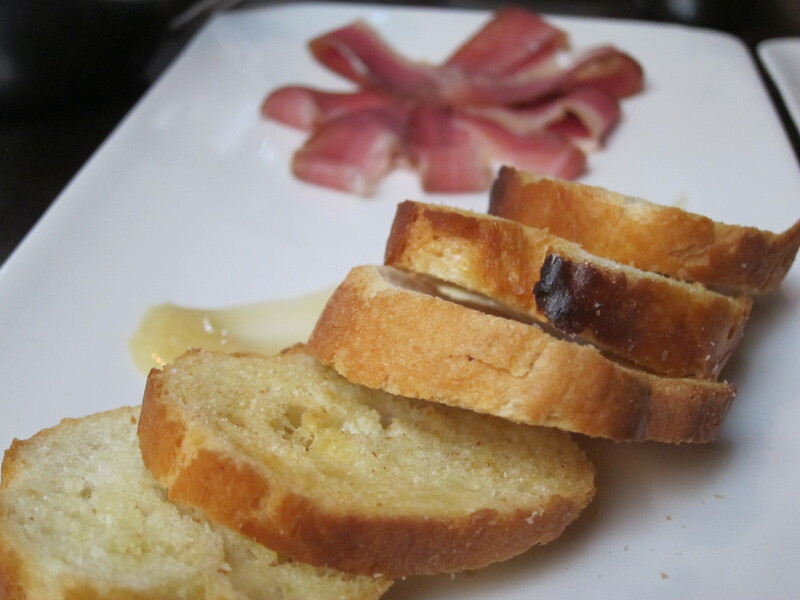 The duck prosciutto with toast and the pistachio-crusted pate were both delicious, as were the main courses. Service was nice and we sat in plush chairs that were practically couches for one. If you go visiting Victoria, BC you can get there by a seaplane, the Clipper ferry or by driving up and taking the car ferry across. I’ve done all three and I recommend the seaplane for the views or the Clipper ferry for the speed, but we go by car due to my getting seasick. If you get seasick too I warn you that there’s a strait on the way that you will not enjoy. I have a special and irrational dislike of the Strait of Juan de Fuca. There are many other great sights even aside from the world famous Butchart Gardens that I still have not seen. Great tea shops, restaurants, bookstores and clothing stores, surprising for such a small island. One year the Royal BC Museum had an Egyptian exhibit on loan from the British Museum that was superb. It even had real mummies, something I haven’t seen since. Even after 3 weekend trips I can’t seem to fit it all in. Some time ago a friend and I decided on a delicious quest – to eat our way through local tea rooms in search of the perfect High Tea. After a longish pause due to food intolerances, I’m happy to be back on this quest once again. 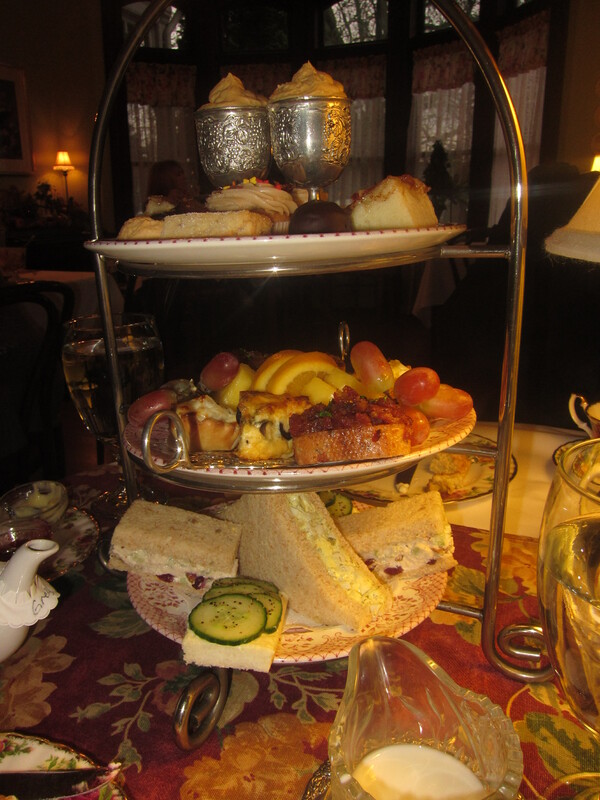 While the Secret Garden tea room in Sumner, WA might not be perfect, it is one of the best I’ve had and easily the best in the Northwest. One Friday afternoon I had some unexpected free time and we wandered down to Sumner. We were lucky enough to find a spot available in a few hours and after wandering local antique stores, we came back. 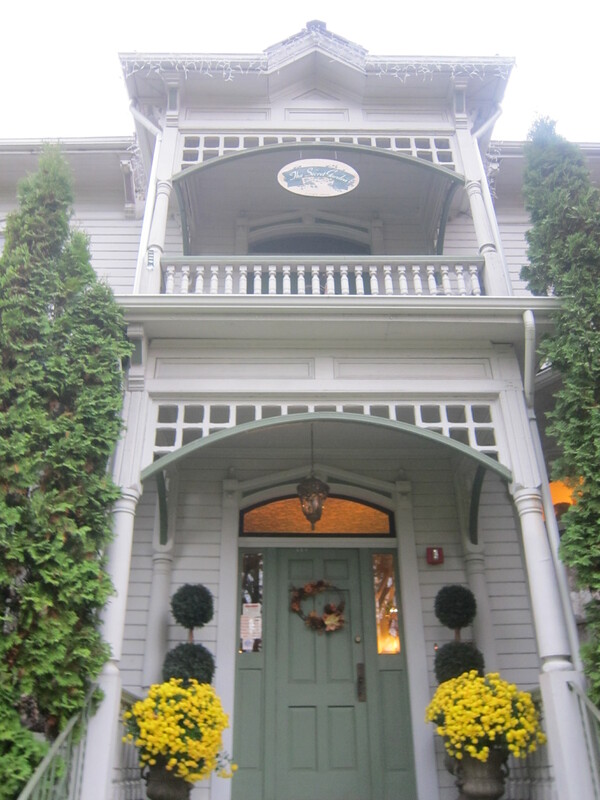 Located in a beautiful old mansion, the tea room was large and bustling with people. We took a peek at their gift shop, where we found charming items like a small set of mussy tussies, little fabric bags for holding a bouquet or sachet. The menu has a good selection of options, I got the Hollyhock for ~$27 that includes a cup of soup, a small salad, unlimited scones and tea (!! 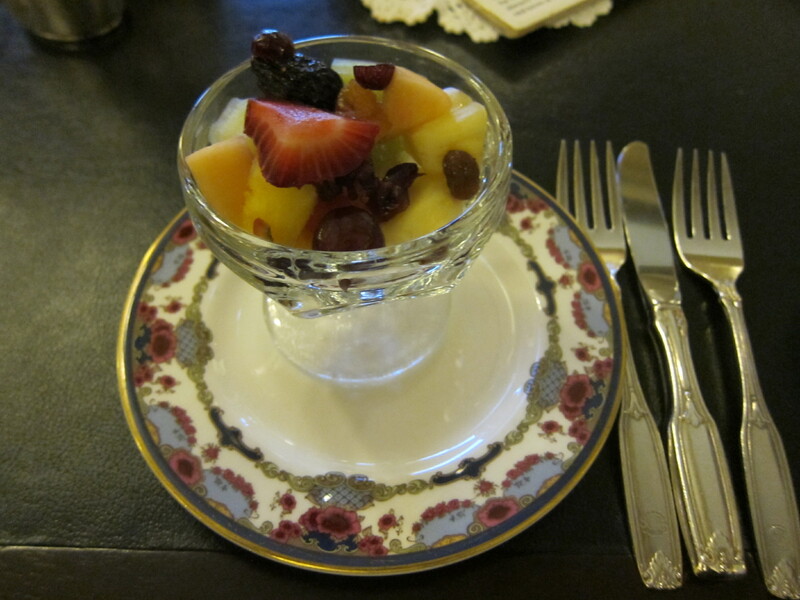 ), a plate of sweets, a plate of fruit and a plate of savory sandwiches. 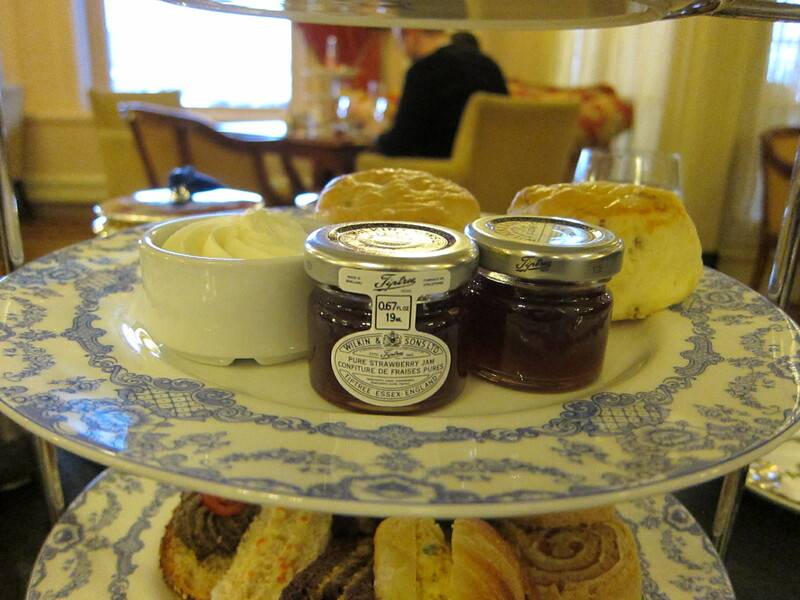 First up was the unlimited scones and tea. It was wonderful, the tea was excellent and very hot. 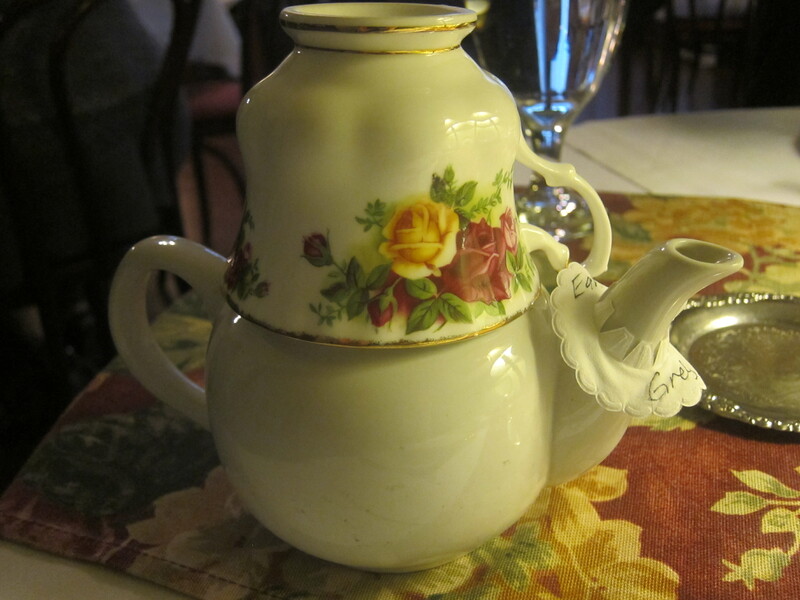 This is one of the most common and infuriating failings in a tea room, so high points on the tea. The cup was not heated (you can see my attempt to warm it), which would’ve been nice, but wasn’t a big deal. I was a little dubious of the pumpkin with coconut milk, ginger and lemongrass but I was really hungry so I ordered it. 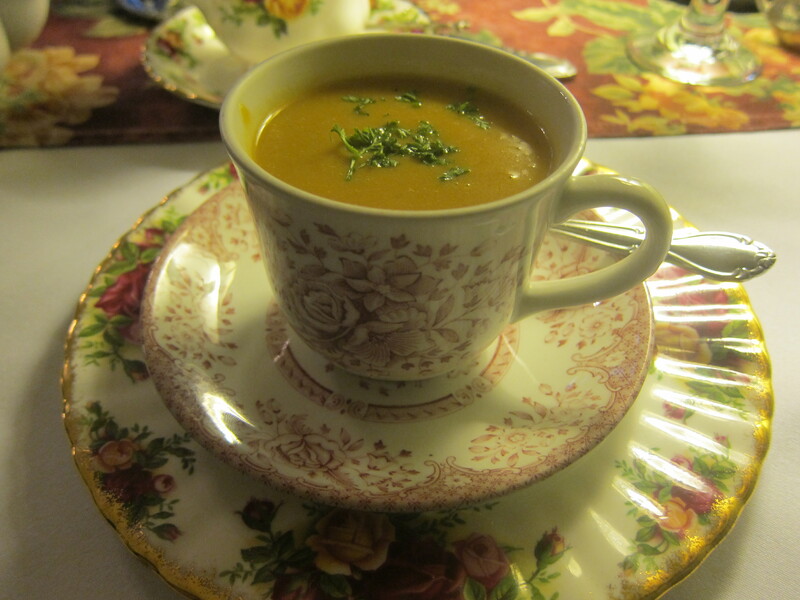 What a pleasant surprise, a warming and fragrant soup served in a tea cup. 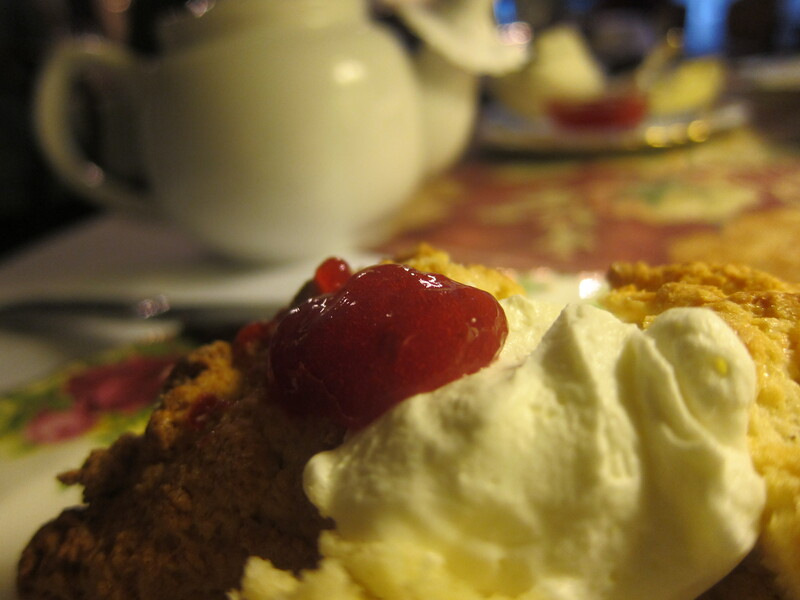 The scones came with as much Devonshire cream, lemon curd and strawberry jam we could stuff done. The scone was light and fluffy and not too heavy. The lemon curd was good but a bit sweet, more like Americans seem to love, so I piled mine high with the amazing cream and jam. Mmm! 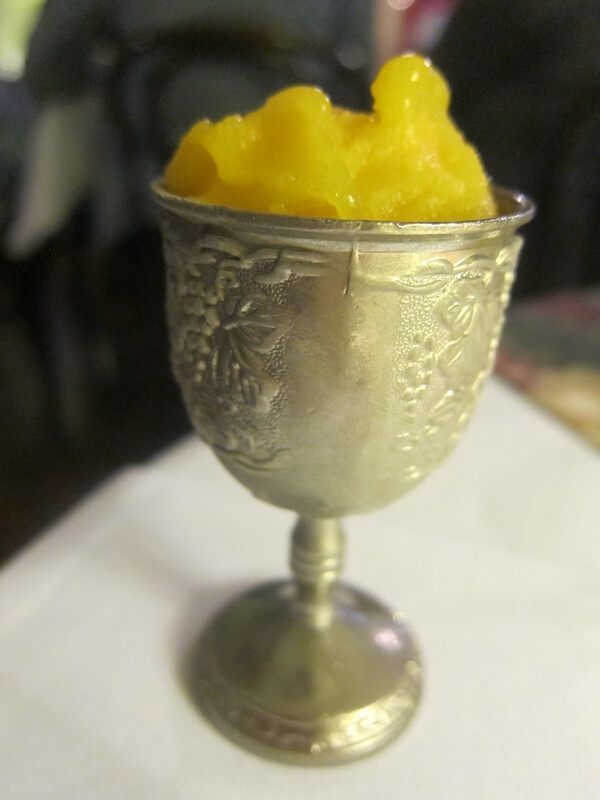 Next up was a palate cleanser of mango sorbet, served in a pewter egg cup, which I really must do at home. The mango flavor was nice and strong. And finally the main courses. So much food. 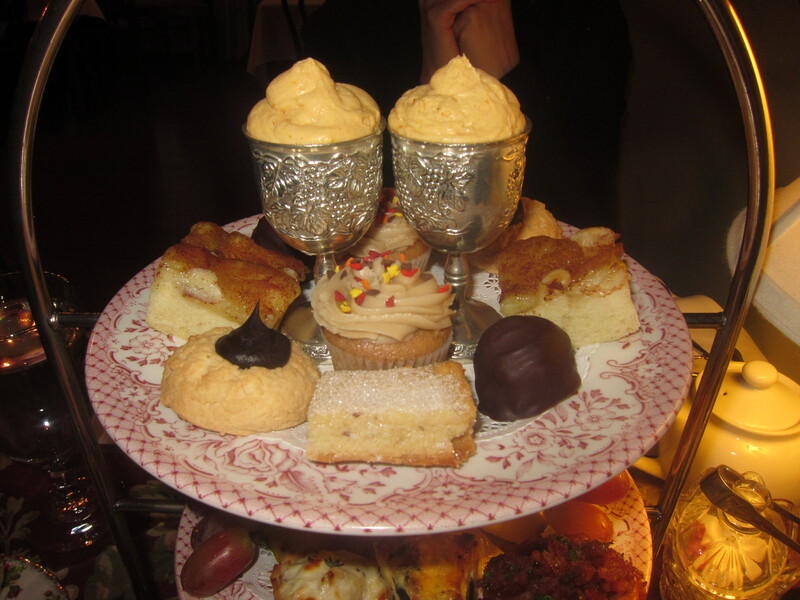 For sweets there was pumpkin mousse, apple cake, truffles, hazelnut shortbread and chocolate-center cookies. Then fresh fruit alongside bacon bruschetta (yes bacon! 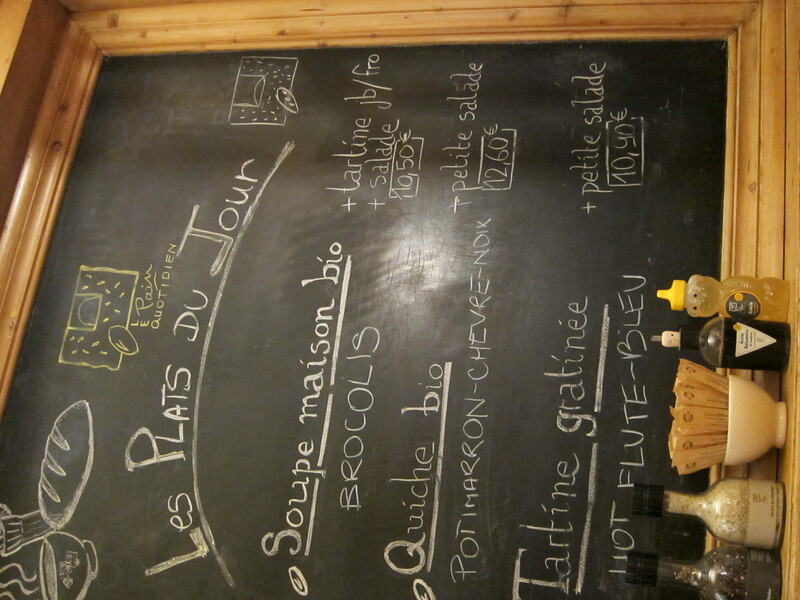 ), Gruyere pastry puffs and olive quiche. Lastly the sandwiches, cucumber on fresh butter, creamy chicken salad with nuts and cranberries, and a divine dill egg salad. The bread was soft and firm, not at all mushy, and everything was incredibly fresh. It obviously was made mostly to order, and best of all we had a leisurely hour and a half to consume all these delectables over multiple courses. 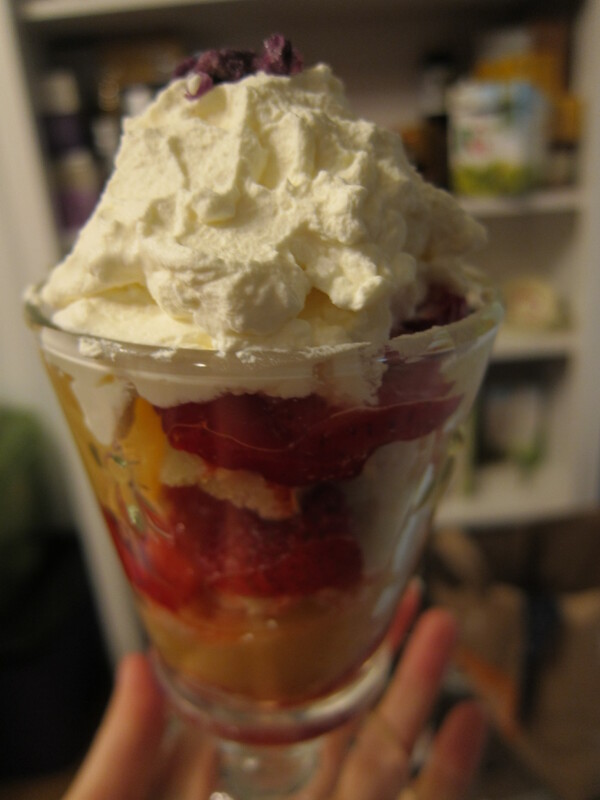 An English trifle is comprised of delicious layers; cake, fruit, cake, fruit and lavish helpings of whipped cream. It usually has custard somewhere in there too. After we ended up with quite a crop of rose geranium plants, we decided to try the pound cake described by the Herb Farm Cookbook. It’s quite simple – just make your favorite pound cake recipe. 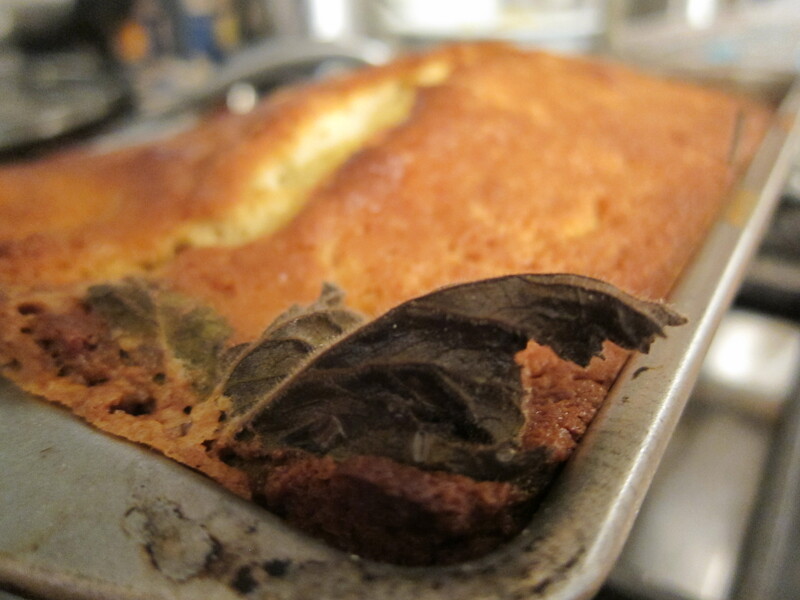 Place the leaves of a rose geranium in a buttered baking tin and cook the pound cake in it. This leaves a delicate rose scent and flavor, especially on the outside. 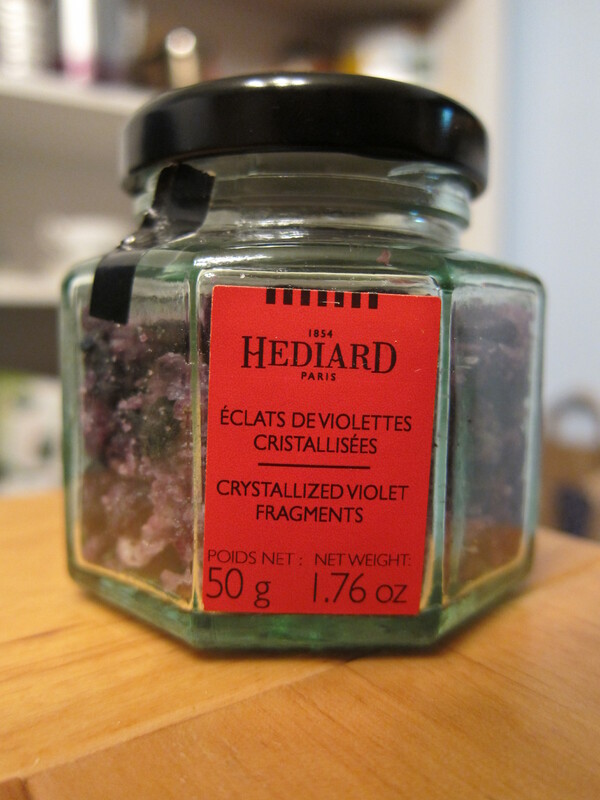 We layered with strawberries and lemon curd, topping our homemade whipped cream with candied violets from my favorite Parisian store, Hediard. For the whipped cream, add 1-2 tablespoons of confectioner’s sugar or really fine sugar (we’ve cheated and used normal sugar, it’s passable) and 1 teaspoon vanilla extract. I really love Paris. Well, almost everything about Paris (aside from the smell of those subways, which caused me to be dubbed “The Ninja” by traveling companions as I wrapped a black scarf over my face). But I digress. Back to the amazing. Pâtisseries, cafés, bistros, not to mention the crêpe stands near the Notre Dame de Paris … most of my memories center around food. What better way to share my trip to Paris than over a few delicious meals? And a reminder to myself as I’m learning French about how much more amazing it will be to return speaking French. 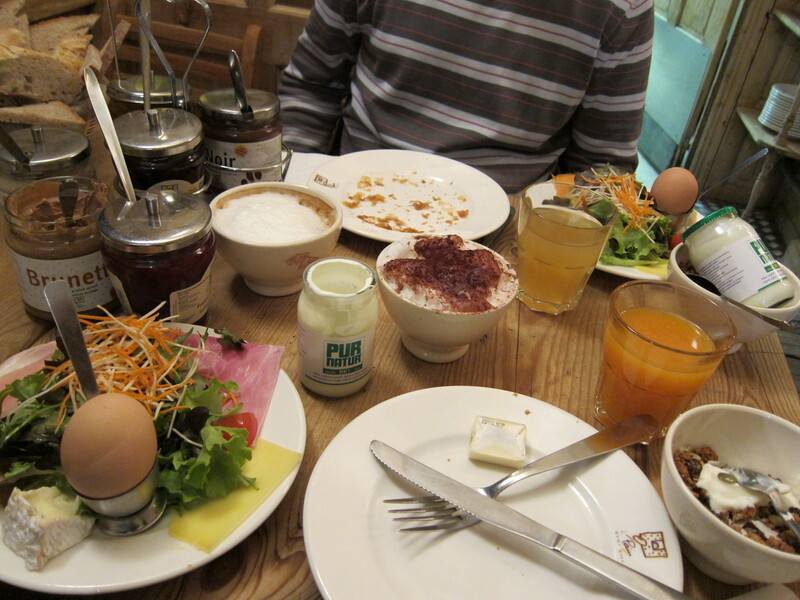 Petit dejouner at Le Pain Quotidien – a not so small breakfast after all, featuring soft boiled eggs, salad with cured ham and several cheeses, thick creamy yogurt with homemade granola and delicious baked goods smothered in jam or Nutella. And don’t forget the fresh squeezed orange juice. Fear not US residents, they even have a few in the US and the lunch at their Los Angeles location was very tasty. 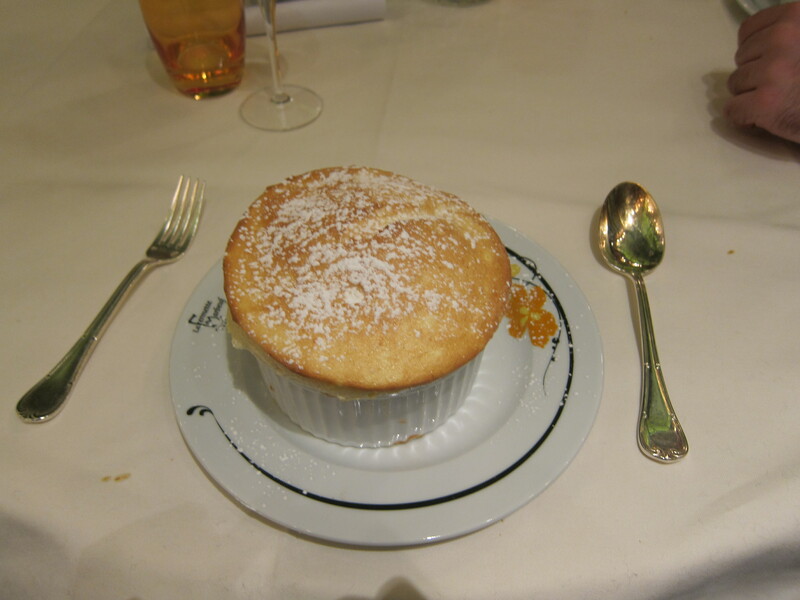 Grand Marnier Souffle at La Fermette Marbeuf – a light, hot and fluffy concoction full of sugary sweetness and the hint of orange liqueur. 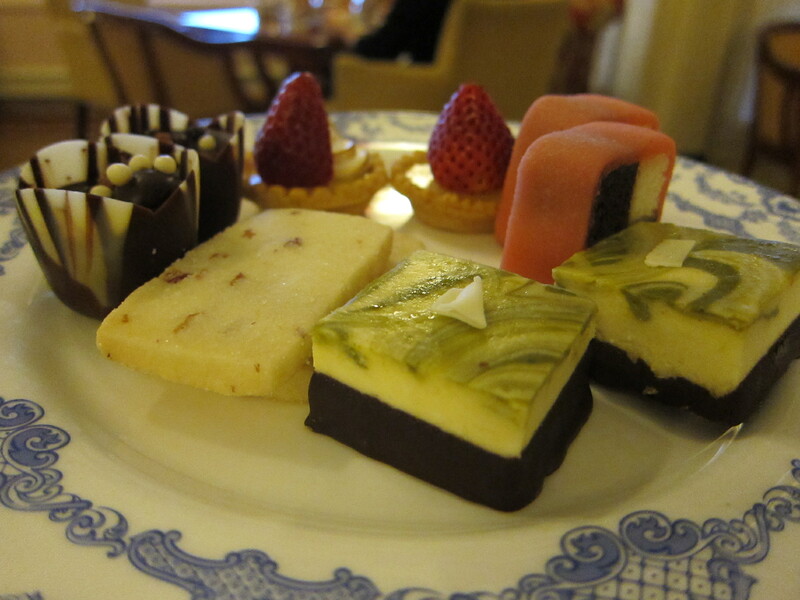 The grand prix menu was expensive but delicious, and a great way to soak in the gorgeous Art Nouveau decor. 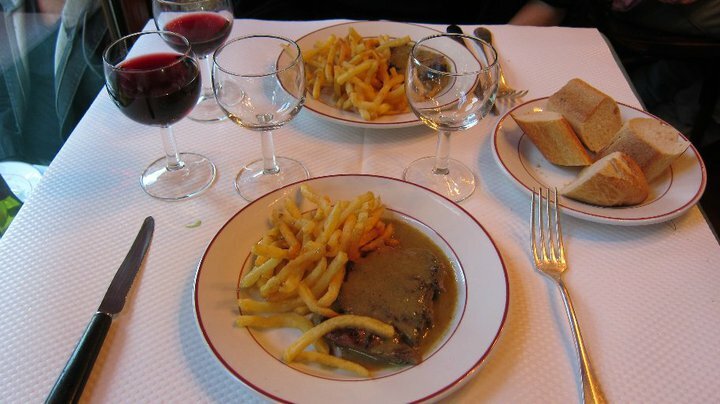 Steak frites at Le Relais de L’Entrecôte – they only serve steak and fries at this restaurant, along with a choice of house wine or soda, and bread. But honestly that is all you need. Deliciously smothered in a meaty, herby sauce and large portions that are re-filled along with crispy fries, mmm! 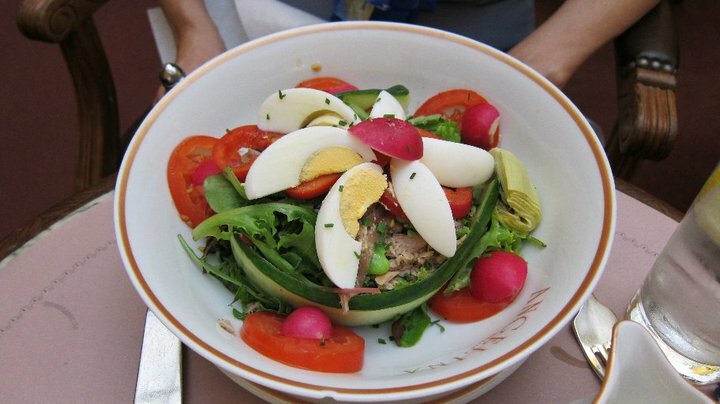 Salad Niçoise at Angelina’s – while decent, the food at Angelina’s was by no means as delicious as their confections, and for the price I highly recommend sticking to dessert and eating your meals elsewhere. But their chaux au chocolat (hot chocolate) is good and strong, and they are famed for their chestnut desserts called Mont Blanc. 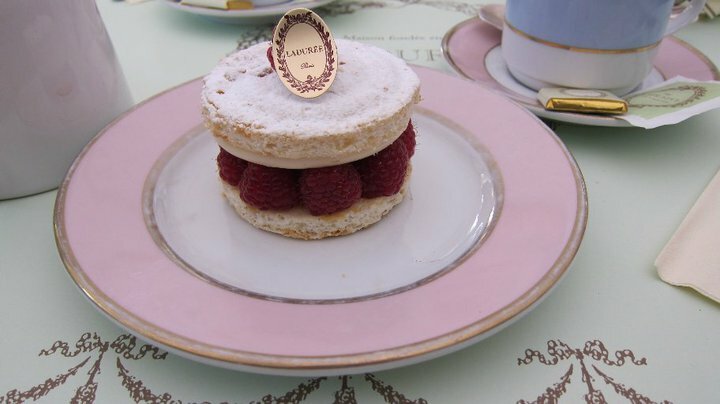 Gateau et thé at Ladurée – a pâtisserie famed for macarons that has shops along the Champs-Élysées and other high traffic areas. 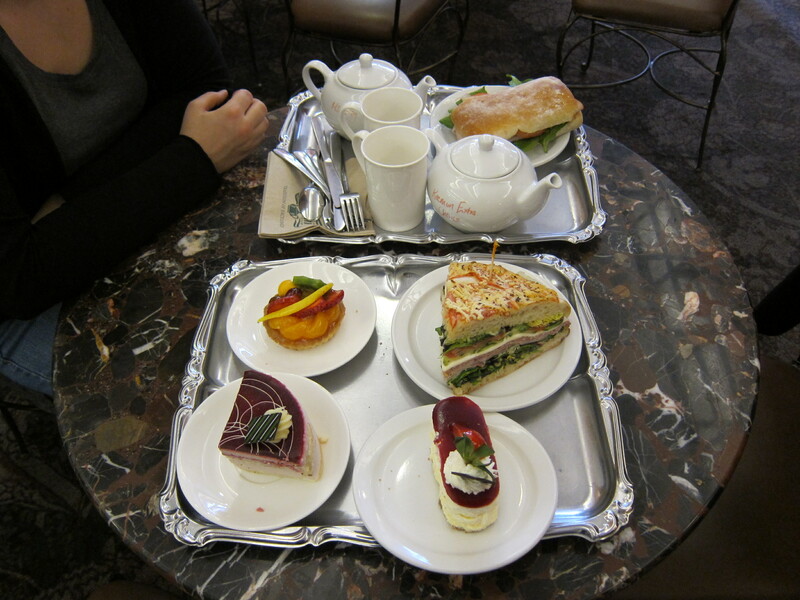 Sitting down to thé (tea) and gateau (cake) was a highly relaxing moment after a stressful day being jostled by crowds. 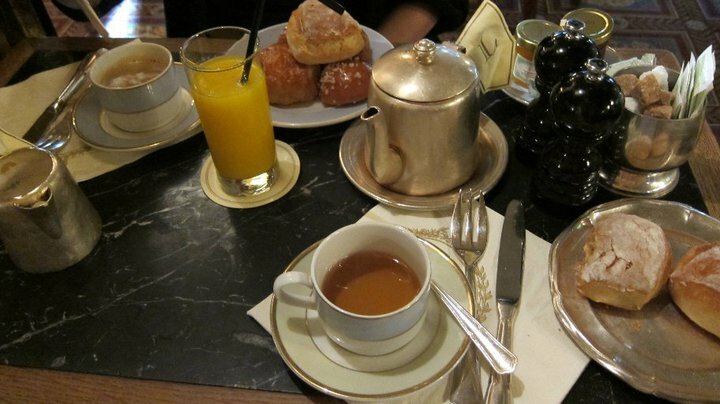 Petit dejouner at Ladurée – while we’re on the topic of that well-known pâtisserie, what about breakfast there? Oh so worth it! Possibly one of the most enjoyable meals we had, with soft boiled eggs and toast soldiers, sweet and savory buns, juice and coffee, and an exquisite opportunity to watch real Parisians in a small setting. Très chic! For my birthday this year I decided that in lieu of a traditional party, I wanted a tea cup exchange. 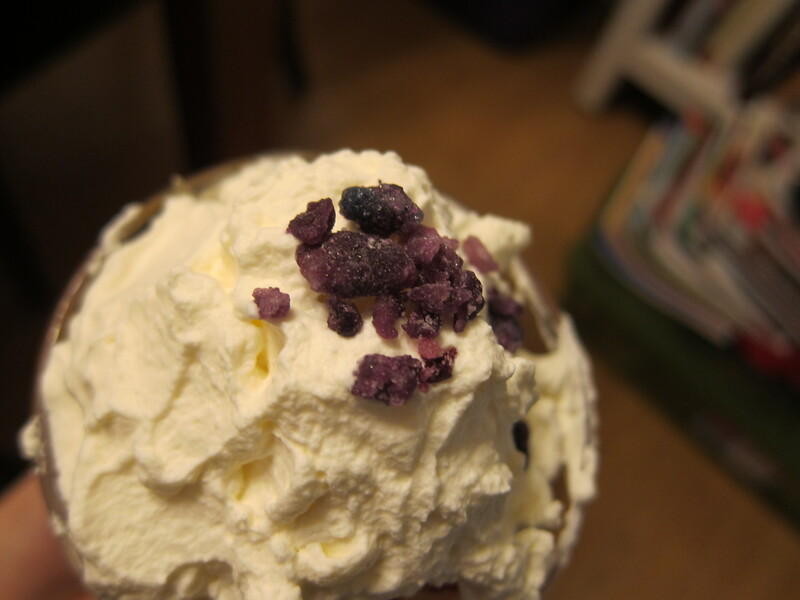 I invited 14 people, more than I can comfortably seat at home, so I picked a restaurant with lovely desserts and drinks. I wanted to do full afternoon tea and if it had been only women, I probably would have made everyone squeeze into the tiny seats at our best nearby tea shop. But there were 10 of us, including a few men that I wasn’t sure would enjoy afternoon tea, and the nicest tea shop that was also spacious is 25 miles away. Invite everyone to a group-friendly restaurant or your home. Include parking directions. 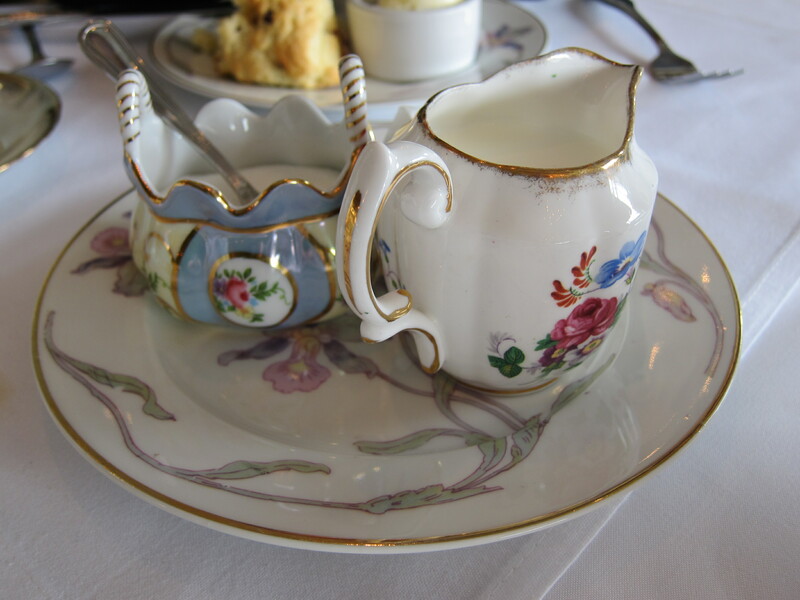 Include a few links to tea cups so that everyone knows relative price and quality. Make tea favors – I filled old tea tins with inexpensive tea bag holders from Amazon and tea bags from my collection. I customized the tea for each recipient. Have a few spare gift bags on hand if someone forgets to wrap their tea cup. For guests who can’t make it in person, have them send or give you a tea cup in advance, and you can include it in the swap. All the bags or wrapped cups are put on the table. Guests draw a number. #1 picks a cup first and unwraps so everyone can see it. #2 gets to either unwrap a new tea cup, or steal the first one. Each guest gets to open or steal a cup. Usually after a cup is stolen twice, it cannot be stolen again (an alternate is that on the third steal, it goes back to the original picker). I highly recommend exchange parties, they are really fun and a good way to connect with friends or meet new ones.